Turbocharing has been around since the early part of the century. It was first used in aircraft to improve engine performance at high altitudes and it also had applications in diesel truck and heavy equipment engines. Turbochargers, like superchargers, increase power by forcefeeding an engine more air than ambient pressure would allow. If one remembers that an engine's power is dependent on how much air can be processed and converted into power, the advantages of forced induction are clear. A smaller, forced induction engine can use as much air (or more) as a larger engine. Combined with the appropriate amount of fuel, astounding power gains can be achieved. Formula 1 in the late eighties saw short-lived 1.5 liter turbocharged engines producing over 1000 horsepower. Superchargers and turbochargers differ mainly in their approach. Superchargers are driven by the engine, usually on an accessory belt. The advantage is that they are always running, giving added power at all times. The disadvantage is that they sap power as the engine must use some horsepower to turn them. They also tend to decrease fuel economy as most superchargers are always running. Turbochargers, on the other hand, are not connected to the engine and do not rob a powerplant of horsepower directly. Located on the exhaust manifold, turbochargers use the fow of passing exhaust gasses to spin a small impeller. The impeller is connected by a shaft to another impeller that is inside a compressor housing. When the shaft is turned the the exhaust-side impeller, the compressor side forces air up to the intake manifold. The engine can then take advantage of the extra air available by adding the appropriate amount of fuel. Another major benefit of turbochargers is that an engine can be designed to cruise with very little or no boost, giving a comparatively economical mode of operation. When the driver wants more power, he or she pushes down on the throttle and the turbo adds boost as rpm and load builds, producing stronger acceleration and throttle response. While it may seem like turbochargers add horsepower without drawbacks, there are inherent costs within their design. A turbocharger's interruption of the exhaust flow does not allow exhaust to exit as freely, raising exhaust temperature. While more horsepower does result, the engine runs at higher temperatures, causing oil temperature to soar. This heat can, especially around the turbo itself, cause oil breakdown. A dependency on exhaust volume to drive the turbo brings up one of the bigger problems with turbochargers, commonly know as lag. This characteristic appears during the time it takes for the turbo impeller to reach a speed that can produce sufficient pressure to aid performance. Most turbo cars have little power through the lower rpm range, when the engine is not producing enough pressure in the exhaust manifold to spin the turbo impeller at high speed. Once the turbo is spinning and able to forcefeed pressurized air to the engine, power builds quickly. The turbo produces volume based on the amount of exhaust flow past the driven impeller. Depending on engine speed and load, more air (boost) is delivered to the cylinder. The harder the engine is pushed, the more power it makes. This boost adds air volume to the cylinder which dynamically raises the static compression ratio as boost is added. The more boost, the higher the compression. Turbochargers must, however, be limited in their production of boost. Why limit it? Modern turbos can procduce enough boost that, left unchecked, can literally blow the bottom-end out of an engine. Boost can be regulated by bleeder valves better know as wastegates. Mild increases in boost done incorrectly often cause head gasket failure or worse. If the wastegate were to fail completely, a car designed to run 15 psi of boost may produce as much as 22 psi. Such high compression will destroy the engine in short order. Controlling manifold pressure is essential in utilizing the powerful advantages of a turbocharger. The turbocharger itself will continue toincrease output regardless of any input other than exhaust flow. The introduction of a wastegate, then, allows control of how much boost ultimately reaches the engine. There are several types of wastegates, including intake and exhaust, mechanical and electronic. Porsche's 924 Turbos and 944 Turbos use exhaust wastegates to divert exhaust away from the turbo and this regulate the amount of boost the turbocharger can produce. The wastegate itself is a device which is a spring-loaded (in Porsche applications) valve that has a diaphragm attached to it. Pressure from the intake runner or manifold is fed to a chamber above the diaphragm. When there is enough pressure, the diaphragm pushes against the spring, opening it gradually. This sounds like a whoosh when it occurs. Pressure bleed-off allows the turbo to continue operating, but prevents it from producing too much pressure. Many other manufacturers have used turbochargers to increase performance, and designs have varied. Turbo cars, however, tend to have one thing in common: lower compression ratios to prevent unnecessary stress while on boost. At a compression ratio of 8.5:1, the 944 Turbo is tractable around town and will have a fairly long engine life. Boost can be increased to some extent without adding excessive mechanical stress to the engine. It is important to understand, however, that increased boost generally means increased heat, stress, and other causes of shortened engine life. While mild increases can be relatively safe, one must weigh the compromise that is made when modifying a turbocharged engine. Larger increases often prove to be reliable, but adding 75 horsepower to a motor engineered to produce 236 horsepower may have other long-term consequences. The most common method of increasing power in turbo cars is increasing the boost. Raising boost by one or two pounds per square inch can give significant increases in power. Different wastegates, either bigger or electronically controlled, can allow less boost to be bled off, sending more to the engine. Adding more fuel (fuel enrichment) allows the increased air to be ignited correctly. This can be done through a variety of ways, whether through engine management computers or boost-referenced fuel pressure regulators. The early 924 Turbo offered a full 30 horsepower over the standard 924. 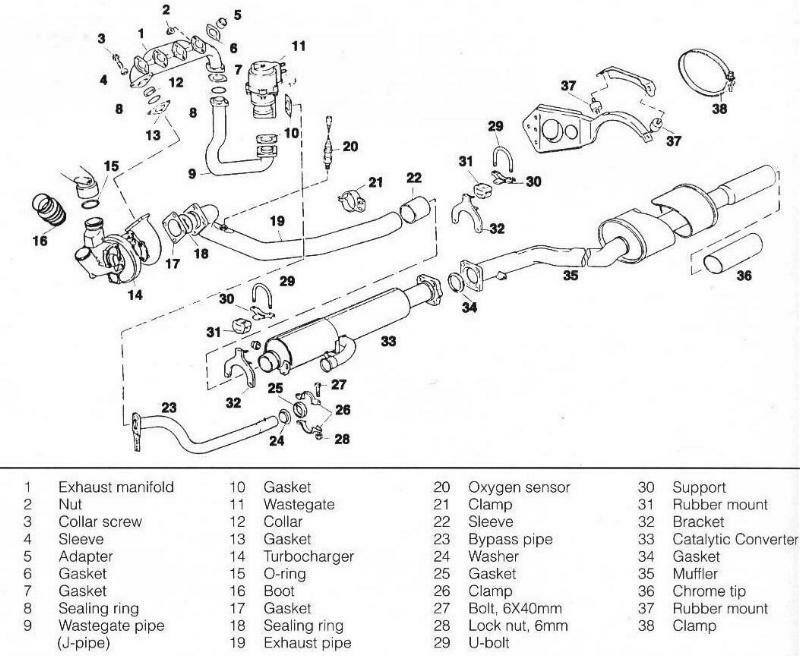 To regulate manifold pressure in the first 924 Turbo, Porsche used a bypass based on a pressure-balance system. If the pressure in the intake manifold is higher than in the intake runner, a pressure-sensing valve equalizes the pressure on both sides of the intake turbo impeller. This system has the pressure bypass valve built into the turbocharger. The system allows the turbo impeller to continue rotating at a speed that allows quick throttle response. Matched correctly, there is little delay in throttle response, allowing for a turbo that responds at as little as 1500 rpm. The 924 Turbos use this feature to give an almost flat torque curve from approximately 1800 rpm to 5000 rpm. The exhaust side of a turbo system must be well-designed. If the system does not flow freely enough, the turbo will be sluggish as spent gases cannot leave the impeller area quickly. The engine will also run at higher temperatures. Without enough back pressure, however, exhaust will pop back and send flames shooting out the tailpipe and wastegate exhuast. The 924 Turbo uses a compact system that has the turbo, exhaust manifold, and wastegate wedged in next to the right side of the engine. This makes for some rather interesting techniques to remove components. It also generates so much heat that a vent was added to the hood to cool that side of the firewall. Some parts of the exhaust manifold get so hot that it may develop stress cracks, some bad enough to require replacement. The exhaust and muffler, however, were state-of-the-art. The muffler and (for the U.S.) catalyst are stainless steel. The forward muffler has exhaust from the wastegate enter into it. For U.S. models, this is just behind the catalyst. At the rear, there is a resonator that resembles a muffler in appearance. The exhaust systems for both models do not pose any reliability issues other than the 924 system cracking around the forward mount by the turbocharger and both models sometimes melting a catalyst. The catalyst equipped U.S. 924 Turbo and later 944 Turbo models have the wastegate exhaust routed to behind the catalyst itself to prevent possible flames from damaging the catalyst. The cylinder head was a new piece and had an improved combustion area and revised porting and repositioned spark plugs because of exhaust manifold clearances and heat generated in the turbo area. The engine also received a new oil cooler and thermostat to aid in reducing oil temperatures. But there were a few probems with the system. The oil feed to the turbo was routed close to the exhaust manifold. When engine temperatures soared, the oil in the engine and the feedline cooked, which in turn led to premature turbo failure. Most early turbos had to be rebuilt or replaced at less than 60,000 miles. Labor was 8 to 10 hours and the exhaust manifold usually had to be replaced. Those wanting more perfromance had to fiddle with some questionable aftermarket parts that modfied the wastegate for more boost. Porsche realized these shortcomings and for mid-1980 went to an improved ignition control and revised turbo and intake tracts. This yielded a full 45 horsepower over a standard 924 and was more reliable than the 1979-80 924 Turbo setup. The engine breather system was also revised to decrease head gasket failures and oilvapor generation. The ignition, a preview of the DME ignition, was the key. The wastegate and exhaust remained the same. The CIS system had a bypass which could enrich and lean the mixture with accuracy, eliminating some of the heat the engine generated. Though reliability was somewhat improved, the 924 Turbo was scheduled to be removed from the lineup and replaced by the 944, so bigger changes were not in the picture. There still aren't many things one can do to add power except by altering the wastegate. In European trim, the 924 Turbo offered more horsepower. The limited production 924 GT Carrera was even more powerful. Converting to Euro spec, however, involves parts not available in the States. Higher compression pistons (8.5:1 Euro vs. 8.0:1 U.S. for 1981-82) were in place for improved low-rpm response and an intercooler for the Carrera reduced intake air temperature. There were some other subtle differences, but these were the most dignificant. Porsche also made improvements to the exhaust gasketing and fastening system. This occurred in the 1983-86 time fram and there are service bulletins that cover this information. Remember, always use the factory bolts to fasten the turbocharger. While expensive, they are specifically designed to work in the turbo application. The fasteners have an order for attachment and torquing. If you have had your turbocharger rebuilt and it won't fit correctly, it may have been reassembled incorrectly. Check the exhaust housing to see if it needs to be rotated. The boot from the CIS going to the turbo inlet can crak, resulting in sluggish performance. The "J" or bypass pipe from the exhaust manifold to the wstegate also tends to crack, resulting in an exhaust leak and a loss of power. This will need to be welded or replaced with a new unit. If your exhaust manifold fails, replace it with the 1981-82 version, which is improved. If you have a 924 Turbo and plan to do an engine rebuild, look for the 8.5:1 Euro pistons as they will improve intown tractablility and throttle response. This change will not alter the emissions curve but will without exception require premium fuel. If you have and early 1979-80 car, you have 7.5:1 compression pistons. The higher compression piston's advantage is particularly noticeable here. When the 944 first appeared, it used the 924 body structure with impoved suspension, brakes, bigger wheels and tires, and other changes. More importantly, it eschewed the Audi-derived four in favor of what was basically half of the 928's V8. The new four-cylinder was far superior in smoothness, power, and flexibility. When Porsche announced the 944 Turbo in 1985, enthusiasts were treated to one of the world's finest four-cylinder sports cars. In designing the 944 Turbo, Porsche recognized that as good as the 924 Turbo was, it had some problems. Turbo reliability, engine cooling, emissions, and serviceability were all improved in the 944 Turbo. With a completely new engine, Porsche had an opportunity to design a turbo system that took advantage of their 924 experience. The turbocharger was relocated from the right side of the engine (next to the heat-generating exhaust) to the left side. Its forward position is much easier to reach in the event a replacement is needed. It is also water-cooled to increase turbocharger bearing longevity. The water-cooling system is regulated by a thermostat. An electric circulation pump continues to send coolant to the turbocharger after the engine is turned off. The 944 Turbo also has an intercooler designed to recduce the teimperature of the intake air. An intercooler is a device that looks much like a radiator or an oil cooler and spreads the intake charge over a larger area which is usually cooled by airflow. Though so-called air-to-air intercoolers are most common, there are also designs using water to cool the passing charge. Cooler intake air lessens the chance of detonation in the cylinder under ingnition. With lower temperatures, more power can be had through more boost. Another advantage is in heat dissipation, reducing overall engine temperatures and providing greater engine life. Porsche proved intercoolers to be effective on the 930 Turbo and the 924 GT Carrera. There is, however, a minor drawback to the intercooler in the form of delayed throttle response. The long runners from the throttle plate to the intake valve via the turbocharger add up to extra distance air must travel before reaching its destination. Porsche also improved the exhaust plumbing by using a tublar header and crossover pipe to route exhaust to the turbocharger. This reduces the buildup of heat on the right side of the engine that 924 Turbos experience, though it still gets hot on that side of the engine. Porsche also redesigned the 2-valve 944 head to accept a ceramic insert, reducing transferred heat from the exhaust port area. This increases longevity by decreasing cylinder-head loads. The 944 Turbo also had revisions to the DME engine management system. The system uses a knock sensor that monitors the engine for knocking or pre-ignition that can damage pistons and burn valves. The system is otherwise similar to that found on the standard 944. With the additional knock sensor, it can alter ignition curves and enrich the mixture to eliminate a knock condition. It also controls boost through a solenoid that actuates the wastegate to reduce boost when knock is detected. With a wastegate controlled by the engine management computer, replacing the DME chip with one having more aggressive mapping will result in more power. The 944 Turbo is one of the few engine systems that witnesses real horsepower gains because the chip controls all of the mapped engine parameters. If you are considering a power increase through a new management chip, there are a few things you should know. There are many chips available; research each offering before you buy one. Some require shimming the wastegate spring so more intake pressure is generated before the wastegate opens. Some of these systems can increase engine output to 300+ horsepower, but overall longevity will be greatly reduced, even with a purpose-built engine. It is also wise to make an improvement in oil cooling in your engine deal with the increased thermal loads. Adding a larger intercooler may be necessary to deal with the increased airflow. Remember that an engine is a system, and increasing one part's efficiency will only increase overall power if the rest of the system is up to the task. Have your engine checked out before you start modification. A leakdown and/or compression test should reveal your engine's cylinder/valve intergrity and how well it can withstand the added stress a chip more boost will cause. If your engine has leakdownj problems or bad compression (lower than factory spec), get the engine freshened first. 1. Add a lower temperature thermostat and thermofan switch, especially in hotter climate and for driving heavy urban traffic. 2. Use only a turbo-approved oil, preferably 20/50 in turbocharged engines. Use a quality synthetic oil. 3. Change oil at 3,000 mile (5,000km) intervals, earlier if the engine temperature reaches extreme levels in traffic. 4. Avoid lugging the engine in traffic and try to keep engine speed above 1500 rpm to keep oil circulating through the engine bearings, turbo and camshaft. 5. Change the fuel filter at 10,000 mile intervals. 6. Change the air filter at 10,000 mile intervals. 7. Inspect all exhuast manifolds for cracking or leaks. All 924 and 944 Turbos have been known to have exhaust manifold nuts work loose because of thermal stress. Always use new nuts, gaskets and hardware when installing these parts. 8. Always use genuine Porsche exhaust components as these will fit (unless the system was physically damaged) and work correctly. 9. If you use your car on the track, install a bypass exhaust pipe to save the catalyst and let the engine run cooler. 10. If you drive on the track, use the air-conditioning on you cool-off lap to add more airflow through the radiator. Drive or let the engine run until the temperature come down. 11. If the cooling system boils over, check for a blown head gasket immediately. 12. Track-only 924 and 944 Turbos should use studs rather than head bolts to aid in reducing the chances of a blown head gasket.